Our manufacturing facility is located in Hull, providing an excellent base with good transport links for distribution of products to customers throughout the UK and overseas. We produce more than 75% of what we sell at this site. 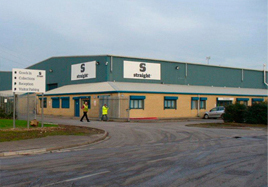 Previously known as Powell Plastics, the Hull site was a key supplier to the Straight Group before we acquired it in 2010. Since then, we have invested close to £3m in developing the site and expanding our production capability. The site now has more than twenty state-of-the-art, energy efficient injection moulding machines and three blow moulding machines with in line recycling. More than 100 staff are employed at this site. As part of an ongoing development programme, the factory itself has seen substantial growth. We have expanded the internal site by 40% and the external storage area by two thirds. This has considerably improved our storage and distribution facilities. The extra space also enables us to store many key products from the Straight range as stock items for immediate dispatch, including wheeled containers, compost bins, water butts and compostable liners.